Every year at this time I think how much I love autumn – the colours, the particular autumn smell, the misty mornings that (sometimes) give way to sunny days and just generally something different in the air, which for me, always seems like expectation of something about to happen or a sense of pleasant anticipation. It may seem strange to feel like this about a season, which effectively leads us into the more dormant and indoorsy period of winter but September and October have evoked these same feelings in me since being a small child. It is also of course a time when the bounty of the hedgerow is perhaps at its most apparent and, long before I became interested in the medicinal or even food properties of plants, the sight of a rowan tree dripping with orangey-red berries or a hawthorn tree full of haws brightening up the roadside had the power to lift my spirits and make me smile. The last couple of years the appearance of these fruits has also signalled the start of a busy period of harvesting and processing. On a similar theme, the drastic shortage of elderberries this year, which a few other people have noted in their blogs means that I may end up not making anything with them this autumn – instead having to eek out the elixir and tincture leftover from last year or find alternative anti-virals for colds & flu (ideas welcome…). Although disappointing not to be able to replenish stocks of elderberry elixir, the abundance of haws, rosehips and rowans seems to be nature’s way of making up for this! This year I have had a go for the first time at making rowan berry and apple jelly (pictured & recipe below), a small amount of sloe gin (although the sloes have not been particularly abundant around here this year so I only gathered a few), hawthorn berry brandy and vinegar (currently macerating in cold and warm dark places respectively) and rosehip syrup (recipe below). Last weekend I took further advantage of the fact that the hawthorn bushes are so laden with berries to gather some more in order to have another go at the festive hawthorn chutney I made last year (will let you know how it goes & post the recipe if successful). Last year’s batch was very nice as a first attempt but this time I intend to use some jam sugar to help with the set and also to cut down slightly on some of the spices used – the cloves and allspice in particular were rather overpowering in last year’s batch. For the rowanberry & apple jelly I slightly scaled down a recipe that recommended the following amounts: 1.8kg rowan berries, 1.4kg apples, 450g sugar per 600ml juice (I used half & half jam sugar & normal sugar). I simmered the berries for about ½ hour until soft & mushy then strained through a jelly bag which took some time, measured the juice & added the corresponding amount of sugar then cooked at a boil for a few minutes. To test for a set I put a drop of the liquid on a cold plate in the fridge. I had to bring back to a boil 3 times before the setting consistency seemed ok (i.e. there was a trail left through the jelly when you run your finger through it on the plate). Although it is supposed to be left to mature for a few weeks, I did fill one very small jar to try after 10 days – pretty happy with the results. Nice on toast, with lamb and also with pate (according to my boyfriend anyway…)! 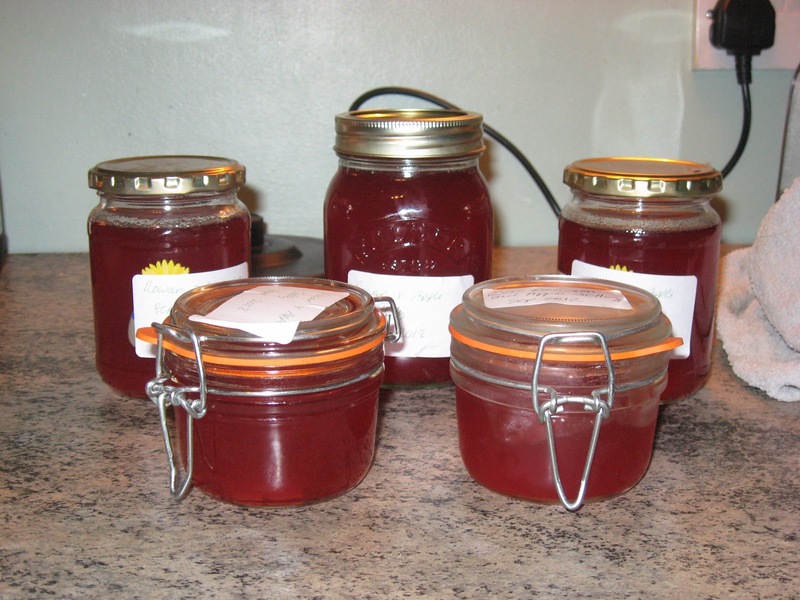 There are a number of rosehip syrup recipes out there with widely varying measures, especially as regards sugar content of the mixture so I sort of took a middle of the road approach and combined a few suggested recipes to make this simple cordial. I basically used a weight ratio of 2:1, rosehips:sugar. I did not de-seed the hips but mashed them up in the blender before adding to boiling water taking off the heat & leaving to steep for about 30 mins. I then strained through muslin to ensure the hairs of the seeds (which cause itching and irritation) did not get into the final juice. I then used the pulp again to steep in the second lot of boiling water & repeated the steeping & straining process to extract the maximum amount of goodness from the berries. For the first steeping I used twice as much water in litres as there were rosehips in kilos (i.e. 2 litres water to 1kg rosehips) and for the second steeping I used 1:1. Finally I added the sugar, cooked until it had dissolved & simmered for a few minutes then bottled the cordial. I would assume for thicker syrup you would simply need to either use more sugar or reduce the liquid for longer. However, mine has come out fairly runny but still flavoursome and ok to either take by the spoonful or dilute in water like squash. I had personally never had rosehip syrup before but when I gave some to my mum she said it brought back real memories of her childhood when she remembers it as being quite a treat – so the recipe can’t be too far off the mark! ﻿﻿﻿﻿﻿﻿﻿﻿In addition to berry gathering and processing (all of which always take far more time than I think it will but is usually rewarding at the end of it! ), I have been decanting some of the tinctures and vinegars I harvested herbs for towards the end of the summer as well as starting to find storage for the various herbs I have been drying and laying some of the late ones out to dry. ﻿I have never really worked much with roots before but last weekend I dug up my HUGE elecampane root and split it, in order to harvest some to make a honey with the fresh root (pictured) and dry some for use in a cough syrup later in the year (I have a friend who always gets a terrible cough in the winter so hope to make her a cough syrup using the elecampane root and possibly some of the hyssop that I harvested and dried earlier in the summer). Whilst off work this week I also finally got round to adding beeswax to my double infused plantain oil in order to make a salve for insect bites next year (incidentally I also found that a ribwort plantain infusion used as a cold wash works wonders on sunburn so was extra happy I gathered some in Stow at the herb festival as that was probably the only weekend this summer where it was possible to get sunburnt in the UK - and I did!). 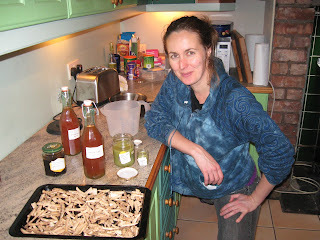 Here is a picture of me with some of the fruits of my labours – chopped elecampane root ready for drying, newly decanted motherwort tincture in vodka, 2 bottles of rosehip syrup and 2 pots of double infused plantain ointment. I should also not forget to mention the grand opening of my first ever batch of elderflower fizz (recipe below), which has gone down well with those who have tried it and was very easy to make, although it took longer to go fizzy than the recipe I was using suggested. For 4.5 litres water I used about 10 heads of elderflowers (the recipe said 6 but I increased it due to the amount of rain we had had washing off the yeasts on the flowers), 2 lemons, 2 tablespoons cider vinegar. I left the elderflowers & sliced lemons in a bucket of water for 36 hours, strained, added the sugar and vinegar & stirred until dissolved then bottled in plastic bottles (apparently when the liquid starts to fizz there is a danger of glass bottles exploding if you forget to check them so played it safe with plastic). It took at least a month for the liquid to really start to get fizzy and another few weeks before I actually tried it – but was worth the wait. Well, I have been pretty rubbish at blogging since the beginning of the year so, after a stern reminder to us all from Sarah, I will try and redeem myself whilst I have a day or two off work! To be honest, I don’t think I can begin to cover everything I have done during the year so next month I intend to do a bit of an inventory of the herb cupboard, which is looking surprisingly full, and this should give the reader more of a flavour of herbal activity throughout the year. 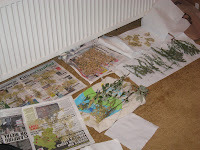 In terms of the apprenticeship tasks, I have to admit I have tended to pick and choose them, feeling smug when the task list arrives and I have already made a start on some of the activities and (to my discredit) tending to overlook some of the more “artistic” tasks such as painting my herbal ally. The theoretical tasks have been good prompts to keep up my reading around anatomy and physiology – having gained a diploma in it last year I have been enjoying not poring over the books but the tasks Sarah set on looking at specific body systems and the herbs associated with them have provided a relatively undemanding and enjoyable way of keeping the information fresh in my mind and building upon it. The practical tasks have achieved exactly what I hoped they would at the start of the apprenticeship year, in that they have pushed me to experiment more with which herbs I gather and how I prepare and use them (e.g. syrups, salves and even tonic wine at the recent herb festival as well as the teas, tinctures and oils I was already more familiar with). Some months I have had more time to devote to herbs than others and the weather has sometimes made things difficult, but it is quite astonishing how much you can make and learn even with a relatively small amount of time invested. The days (whether workshops or workdays) at the sanctuary are also always very enjoyable and informative and are an important & worthwhile part of the apprenticeship (as well as a way to help Sarah out in return for all the hard work she puts into sharing her herbal knowledge). The herb festival earlier this month was, as ever, a wonderful event with lovely people and fascinating speakers – even the weather was kind. In the next day or two look out for posts on recent activity – of which there has been quite a lot, autumn being a time of real hedgerow abundance (this was one of the months when I was smug when Sarah sent out the task list as had already been working away on rowan jelly, hawthorn berry brandy and vinegar, digging up roots etc). In the meantime here is something I wrote in July but never actually got round to posting! 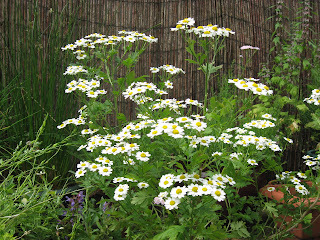 I thought I might have to do without my feverfew when it did not appear in spring in the pot it was in last year and I also had no luck with the seeds I planted to replace it, which were quite old and also got flooded out twice not long after planting and did not germinate. Imagine how pleased I was then when a new plant appeared in the motherwort pot – apparently having self seeded from last year’s feverfew that had been in the pot next to it! The self seeded plant is now thriving. Given this happy reappearance I clearly had to spend some time with this plant and make use of it so this evening I have made a tincture in vodka using the aerial parts of the plant and have also tied some bunches together and hung them up to dry in a paper bag (something I have not done before as I usually dry herbs between sheets of newspaper spread out on the floor but drying space is now getting scarce!). The plant lends itself to drying in this way as it has quite firm stems and is easy to bunch and tie together. 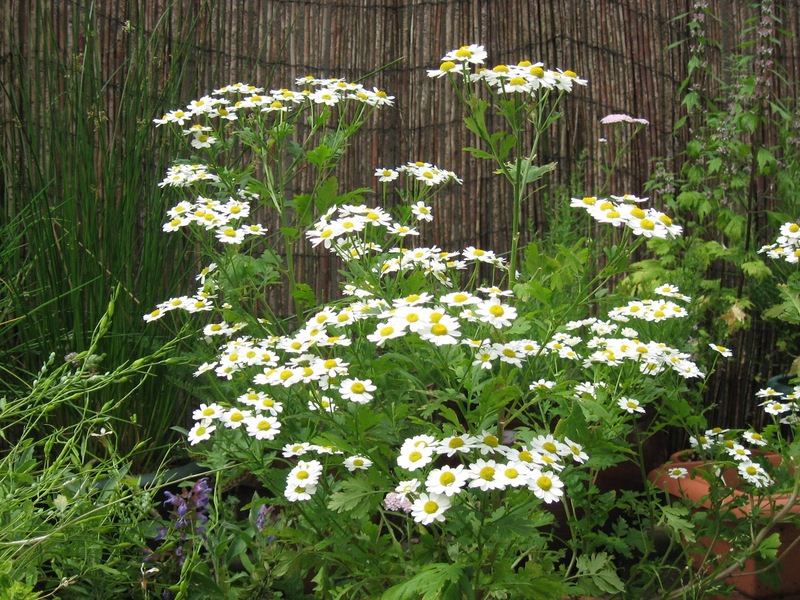 As its name suggests, feverfew is a febrifuge and diaphoretic (inducing sweating and reducing fevers). It is also indicated for headaches, including migraines (some sources suggest a 70% reduction in instances of migraines when sufferers start taking feverfew). Its use to combat headaches is one reason why I have decided to dry the herb for use in teas as well as tincturing it as it seems to make sense to avoid an alcohol tincture when dealing with headaches. Suggested doses seem to be 10-30 drops of the tincture in hot water or teaspoonful doses of a hot infusion of the dried herb taken several times a day during a fever. For treatment of headaches another option may also be eating 1 leaf a day (although it is recommended that the leaves be eaten between slices of bread as they can cause ulcers in the mouths of some people). When I started reading more about the plant, I found that it has also long been used for issues related to the womb such as suppressed menstruation/sluggish menstrual flow and for relieving some of the symptoms of PMT such as headaches, irritability and tension. These uses were of particular interest for me at the moment and I intend to experiment a little with it as well as with other herbs such as motherwort. It is also indicated for regulating contractions during childbirth - for which reason it is advisable to avoid during pregnancy. In addition to all this, modern uses in Culpeper suggest that the tincture be applied directly to soothe itching of insect bites and that it can also be made into an insect repellent lotion by mixing with distilled water. This use does not surprise me too much as the leaves have a tangy smell which is somewhat reminiscent of eucalyptus – though not quite the same and not quite as pleasant. Addendum 27th September – can’t quite believe it is over 2 months since I prepared this post (or that I didn’t actually post it! However, I can now confirm that feverfew tincture is one of the most disgusting things I have ever taken (must be taken in orange juice or something!). It is very bitter and, in my opinion for those of you who have tried motherwort, is far, far more unpleasant! Have not yet been brave enough to try the tea... However, I am persevering with taking a mixture of feverfew and motherwort tinctures in the 10 days or so running up to and during my periods, just to experiment really. I should add that, despite its horrible flavour, I do think this is an amazing plant. As mentioned above, it had self-seeded in another pot from last year and is incredibly hardy. Once I had started working with it I noticed it everywhere and it is a real “fighter” growing out of concrete near houses, between paving slabs and in other similarly inhospitable places for plants. My plant in its pot went woody in early September and I cut it right back but already there is another fresh green clump growing up. I have got quite fond of it ;-). And I will definitely be trying out its insect repellent properties next summer. The end of the month approaches rapidly so, in anticipation of February’s tasks arriving, I thought I’d better update my blog with further info on the theoretical tasks for January. Alongside the practical task of making the elder bark salve for bruises, as described below, Sarah asked us to research the structure & functions of the skin and how bruises form as well as which other herbs are useful for bruises. Having just completed a diploma in anatomy and physiology last summer this was a good test to see how much I had remembered! I am keeping this to a fairly basic explanation (be grateful – my A&P textbook takes about 50 pages to explain what I am going to try and summarise in a couple of paragraphs!). · Protection – the skin is the first line of defence against invading microorganisms, forming a physical barrier between the external and internal environment and also secreting sebum & sweat which form an acidic layer which may also assist with destroying microorganisms. · Temperature Regulation – Sweating and increased blood flow to the surface of the skin helps with cooling the body. Decreasing the blood flow to the skin and raising the hair follicles (goose bumps) helps insulate the body. · Sensitivity – the skin contains various types of sensory nerve ending at different depths which detect touch, temperature, pressure, pain. Additional functions of the skin are: synthesis of vitamin D when stimulated by ultra-violet light (e.g. from the sun); a reservoir for blood; and absorption of certain substances (even though the skin is mainly impermeable, certain substances such as essential oils can be absorbed though it – if you don’t believe me, try rubbing some fresh garlic on the soles of your feet and see how long it takes before you can taste it and smell it on the rest of your body!). The epidermis is the most superficial and consists of 5 layers, which are made up of 4 different types of cells (keratinocytes, melanocytes, langerhans cells and merkel cells). The deepest layer of the epidermis is the basal layer (or stratum germinativum), which is where the skin cells are still living and can reproduce by mitosis, thereby ensuring the skin can heal & renew itself. The cells of the produced in the stratum germinativum grow & push older cells upwards towards the surface of the skin until they become part of the “prickle cell” layer (stratum spinosum), which is where melanocytes (the melanin producing cells which give the skin its colour) are found. The stratum granulosum lies above the straum spinosum & is where the cells start to die & become keratinised, which toughens the outer layers of skin. The stratum lucidum, which lies superior to the stratum spinosum is most evident in the palms of the hand & soles of the feet. It is mde up of tough, dead keratinized cells & provides an extra layer of protection for those areas that may experience the most use/ friction. Finally, we have the most superficial lay (the stratum corneum), which is where the now flattened keratinised cells lie on the surface of the skin overlapping each other and forming a waterproff covering. It is from this layer that the skin is shed (desquamation). The whole process from basal layer to desquamations takes between 3-6 weeks. The dermis is thicker than the epidermis and composed of elastic tissue, collagen & connective tissue. It has 2 layers: the papillary layer, which contains the skin’s capillary beds allowing blood to flow to the skin bringing nutrients and oxygen & removing wastes and CO2, and also some of the sensory nerve endings which detect various sensations; and the reticular layer which contains the hair follicles, sebaceous glands & sweat glands. The subcutaneous layer (or hypodermis) connects the dermis to the underlying tissue such as muscle, bone etc. it protects, insulates & acts as an energy store. How does a bruise form? Bruises (or in medi-speak contusions) are generally caused by some sort of blow or knock that may or may not be painful at the time. They are also often found around the sites of other, possibly more serious, injuries (HINT: it’s worth checking if there are bits of bone sticking out of the person’s fractured shin before you start vigorously massaging in the bruise salve! ;-)). Bruises form when the capillaries in the skin rupture (often due to a blow) and cause bleeding into the skin and the interstitial spaces (space between cells) in the underlying tissues. In a skin bruise, the trapped blood appears first as a red mark with swelling then as a purple or blue-black mark, which as it heals may turn green and yellow. Although we usually relate bruises to the skin, it is also possible for muscles and bones to bruise and these deeper bruises may be considerably more painful (to the extent of limiting activity) and also take longer to heal. It is worth noting that in some cases, bruises may not be caused by a blow but may be a symptom of a more serious condition or a nutrient deficiency. Taking blood thinners like aspirin may also contribute to easy bruising – worth bearing in mind if you bruise really easily with no apparent cause. Yarrow (Achillea millefolium) (aerial parts used) I have heard yarrow referred to as a kind of “cure all” plant, as well as being effective specifically against colds & flu. However, it seems it also acts on the blood as a regulator of high blood pressure & irregular menstruation and helping speed the clotting process (hence its nickname of nosebleed I assume!). Hoffman states that yarrow makes an effective compress for bruises and that an infusion of yarrow combined with horsechesnut can help strengthen the blood vessel walls, which may help in the long term if you tend to bruise easily. The more I look at the manifold properties of this amazing little plant, the more glad I am that it is on my study list this year as I think it really could warrant a full article on its own! NB: I have found a couple of internet references to people having developed an allergic reaction (photosensitivity) to yarrow and to it being toxic in large doses (tho’ would assume most things are?) - if anyone has any thoughts/ info about this feel free to comment…. Comfrey (symphytum officinale) (roots, rhizomes & leaves) – also known as knitbone, bruisewort. Ann McIntye recommends a poultice or ointment for bruises and sprains. It contains a chemical called allantoin, which encourages wound healing & can also be absorbed into the skin and then into the underlying tissues. 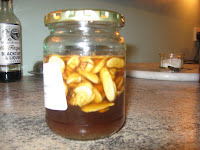 This has made it a well known traditional remedy for healing broken or fractured bones and wounds. it has also been used for treating dry coughs & bronchitis & to soothe the gastric tract. NOTE: It is worth noting that there is some debate as to whether this herb should be taken internally, with some authors suggesting that internal use should be avoided completely due to potential liver damaging (hepatotoxic) effects, others suggesting the prolonged usage should be avoided & others suggesting that it is OK to use the leaves & aerial parts. I reckon it’s a case of look at the evidence, consider what you are using it for & make your own mind up ;-)! Witch hazel (Hammamelis virginiana) (bark & leaves) I can remember my mum dabbing “magic” distilled witch hazel on bumps and bruises when my brother & I were kids. Ann McIntyre writes that its primary use is as an astringent, which make it a good remedy for both internal & external bleeding. 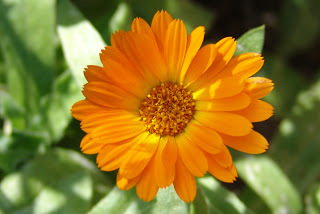 It is a common remedy for burns, bruises, insect bites and skin inflammation. I have also seen it indicated for varicose veins and broken capillaries. I have also found references to the helpful properties of common knapweed (centaurea scabiosa) and sweet marjoram (origanum majorana) when it comes to treating bruises & sprains. Hello reader and welcome to my first ever blog post! I would never in a million years have created a blog account unprompted, but the explanation for this unprecedented event is simple: I have decided this year to become an apprentice with Sarah Head (http://kitchenherbwife.blogspot.com ), who I met about 6 years ago when I first attended one of her wonderfully informal yet informative(!) herb days at Springfield sanctuary in the Cotswolds. During the 1st year of the apprenticeship (Jan – Dec 2012) I will be undertaking a range of tasks set by Sarah (some practical some theoretical) relating mostly to the medicinal uses of various herbs and plants, as well as looking at various common conditions/complaints and which herbs might be best to treat them. As far as possible my tasks/ activities and additional herby findings will be recorded on this blog for anyone who is interested (tho’ I can’t guarantee daily updates – it’s likely to be a rush of info all at once when I get time to write stuff up!). Although the blog is likely to mainly look at medicinal uses of herbs, I expect I will occasionally chuck in a reference to culinary, spiritual, cosmetic or simply ornamental properties as well – since I anticipate all sorts of wonderful things coming to light as I get to know the plants better. Also my interest in wellbeing and alternative therapies extends to massage (I am a qualified massage and Indian head massage therapist), reflexology, healing with energy & reiki, aromatherapy and nutrition so don’t be surprised if I wander off down these paths as well on some of my posts, whenever I have discovered something that needs to be shared! I am very excited about starting the apprenticeship as I have been interested in herbs ever since being a young teenager and being constantly drawn to fiction which seemed to feature main characters with various healing and “wise woman” roles or skills! I have fed my interest in fits and starts over the years, sometimes dabbling identifying wild flowers or food plants or with making various potions – but have to admit that I am ill disciplined when it comes to doing it, partly due to being busy with lots of things/ living away/ work/ sport/ friends/ family/ life in general, partly due to being easily distracted but mostly due to lack of confidence when it come to experimenting with herbs, as well as not being in the habit of using them as part of daily life – two things that past apprentices tell me were easily overcome once they started the apprenticeship and had tasks to try and fantastic workshops to attend every month J! So, I am hoping that this year will help build my confidence with using herbs and my knowledge of why they work, as well as provide me with a “prod” every month to get out there and get gathering! Also, from past experience of Sarah’s workshops I can’t wait to meet the various people from all over who will be attending them through the year to find out what they are doing and swap knowledge with them. Think that’s more than enough intro, so let’s take a look at the first tasks…..
First of all I needed to choose a herbal ally for the year. A number of possible plants came to mind, including dandelion, calendula and meadowsweet but in the end I have decided on lovage. Lovage was one of the first herbs I planted out in a pot in our back yard and, since it seemed to be thriving and my partner wanted something to plant out in a shady spot at the front of the house, I suggested replanting it there. Some years later we have a triffid of 8-9 feet tall which is spreading wider and getting taller every year and attracts no little attention from visitors and passers-by! I thought I'd include a picture of it here so readers can watch it grow with me throughout the spring and summer. Despite having such a good supply of this plant I have not actually got to know it or used it as much as I should have so when I was trying to decide on a herbal ally I suddenly felt that I should pay it a bit more attention. So, I knew where to find these trees but enjoyed spending a bit more time actually looking closely at the bark and shape of the tree, which is sometimes difficult to make out under foliage in summer. 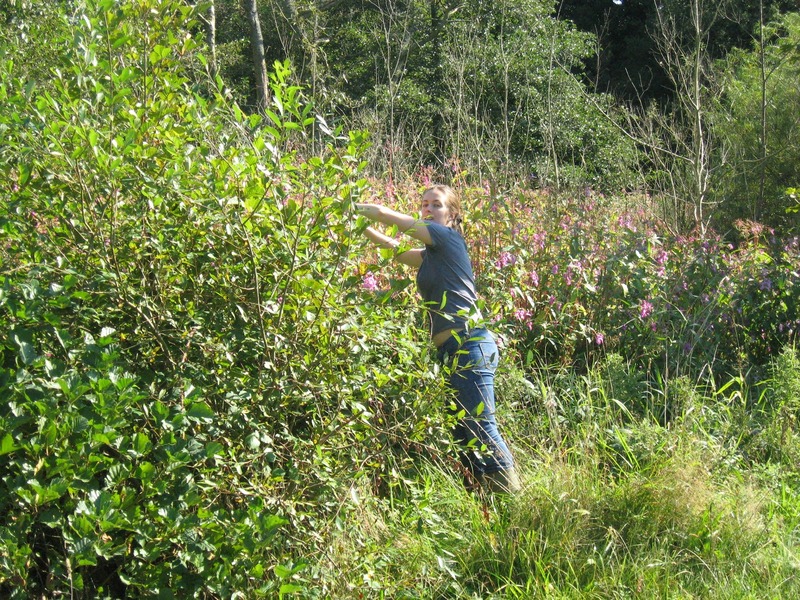 I was less certain about the whereabouts of wild rose bushes – and even more dubious about my ability to distinguish whether or not they were dog rose, briar rose or rosa rugosa, especially in winter when they have no leaves and few, if any, berries. In fact, so far I have only found 2 wild rose bushes tangled in with the brambles. I can identify that they are probably 2 different species of rose, based on the different thorns on each one (think one is dog rose & one is briar). However, they only had one hip to show off between the two of them so I will have to look a bit harder to find my ingredients for the task of making rosehip syrup or honey at the end of the month. My other practical task was to collect elder twigs and make a double infused elder bark salve for bruises (linked of course to our theoretical task of finding out about the structure of the skin and how bruises form – info on this to follow in the next post). I was looking forward to this task as I will admit to never having made a salve, although I have made a few double infused oils. I also really love elder and seriously considered this tree as my herbal ally this year so was pleased to be doing a task that involved it so soon. I therefore set to gathering twigs from 3 different trees (the 3 that I felt were most willing to donate) and soon had enough for the purpose of salve-making. The bank holiday Monday afternoon on 2nd Jan was spent stripping bark from the twigs ready for 4 hours with the slow cooker on Tuesday evening after work (making a double infused oil is easy but does take a bit of time, since the herb has to be divided into 2 batches. The first batch cooks in the oil for 2 hours before being discarded then the second batch goes into the same lot of oil – hence “double infused” oil). Since I had used fresh herb, I left the oil for a few days in a clean jar in order to separate out any water that remained in it (there was not much). Then finally on Monday night I did the final stage of adding beeswax to the oil and gently heating it until it melted. I had just over 8 fluid oz of oil so started by adding just over 1oz of beeswax. However, in the cold water test the salve still seemed too oily to me so I added a bit more beeswax. Once I was happy with it, I poured it into a jar and left it to set – not forgetting to use a bit on a bruise on my knee. I have had to make sure the jar is clearly labelled as it is a honey jar and the salve looks amazingly like honey – don’t want anyone getting a nasty shock when they spread it on toast! Though I imagine the “interesting” smell might put most honey lovers off….